This beautiful garden is built in the heart of the city. It is situated near the Parvati hills. The famous place Swargate is situated around 1 km from the Saras Baug. This garden is spread in around 25 acres. 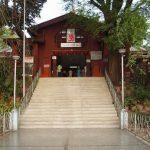 This place is also well known for historic Saras Baug Ganpati Temple. The Ganesh temple present in the garden was built by “Nana Saheb Peshwa”. He started the construction of this temple in the year 1750. It takes around 24 years to complete the construction of the temple and the whole development was completed in 1784. As this temple was built in the lake, it was called as “Talyatla Ganpati” which means Ganpati in the lake. But later on the lake dried up and now we can see very small reservoirs of water present here. Timings: This historic garden remains open from 6 am to 9 pm. Temple Timings: Devotees can visit this temple from 5 am to 8 pm. Photography is not allowed in the temple. Visiting Hours: Tourist spends around 2 to 3 hours here. Entry Fees: Any kind of entrance fees or ticket price is not required here. Tourist can visit this place at any time. But try to avoid visiting in daytime during summers i.e from March-June. How To Reach Saras Baug? By Road: You can use PMPL bus transport or Uber, OLA cab services to reach here from any part of the Pune city. By Railway: The nearest railway station is Pune junction. From Pune junction, you can reach garden by road. By Air: The nearest airport is Pune airport. It is situated around 13.5 Kms and approx. 1 hour is required to reach this garden from Pune airport. Distance From Pune Junction: 5.7 Kms via Jawaharlal Nehru Road. Distance From Swargate Bus Stand: 600 Meters via Jawaharlal Nehru Stadium Road. Parvati Temple: It is present at the distance of 2 Kms. Shaniwar Wada: It is located at the distance of 2.8 Kms and 15 mins are required to reach there via Shivaji road. NOTE: Saras Baug is the best place to visit quality time with your family and friends.